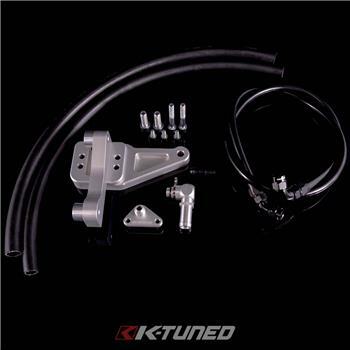 The Power Steering Relocation Kit is a simple kit which allows you to retain power steering while cleaning up the engine bay and moving the power steering pump down to where the factory AC compressor was originally mounted. 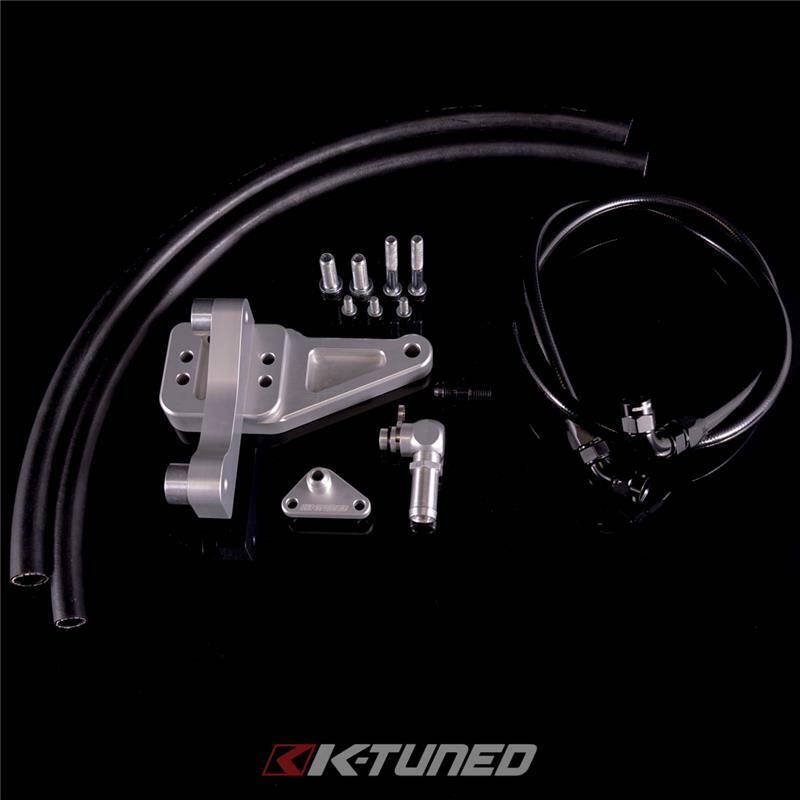 The kit provides everything needed for an 02-04 RSX and k-swap vehicles running an 02-04 PS pump. No more trying to make electric setups work just to see problems arise later. This will retain factory hydraulic functionality with a clean installation. Our high-pressure line is designed to withstand the extreme pressure of the power steering system. The overflow fitting on the pump allows 360 swivel for best routing of the overflow hose and custom mounting. Depending on mounting location of the overflow bottle more hose may be needed, provided is 18” of hose. The bracket features dual mounting positions for multiple application, which allows you to raise and lower the pump depending on clearance with subframe and accessories. This kit will require removal of the AC. The kit includes the relocation bracket, -6AN fitting for the power steering pump, new swivel overflow fitting for the pump, AN fitting for the rack, high-pressure 6AN hose, and 18” of hose for the overflow bottle and cooler, as well as all needed clamps and hardware. If you are using this on a k-swap car you may need to source your own 3/8 high pressure hose for the return from the rack to the overflow bottle. Please note: 05-06 RSX feature a larger pump with greater flow. The car also comes with a larger diameter line and fitting at the rack.